There is a lot more to the world of spices than cinnamon, nutmeg, pepper, allspice, cumin, cayenne, paprika, cloves and cardamom. The huge range of spices used in Cajun and Creole, traditional Indian and Middle eastern food rarely reach the palates of the average cook unless they suddenly decide to cook traditional dishes from these areas. Many consider items like Saffron and Vanilla Beans too expensive – you just need to know where to get them. Spices like Sumac, Star Anise, Licorice Root, Blade Mace, Ajowan, Asafoetida, Fenugreek, Juniper, Orris Root and Szechwan Pepper are overlooked because no one knows what to do with them. Spice blends such as Berbere, Chaat Masala, Chermoula, Garam Masala, Harissa,, Panch Phora, Ras el Hanout, Shichimi-Togarashi and Za’atar suffer the same fate. Even the quite exciting world of Australian spices such as Bush Tomatoes, Lemon Myrtle, Mountain Pepper, Wattleseed etc are overlooked in the Australian kitchen, and are seen as perhaps being a bit ‘hippy’. My interest in spices began when I decided to have an Indian party at home, cooking traditional Indian food. Some of the spices I had never heard of, so had to go on a search to find them. Despite the inconvenience of not being able to buy them in my local supermarket, they made such an incredible difference to the taste of the food that it sent me off on a stint of research and courses to find out more about them, and there uses – not just in traditional cooking, but how they can be used in contemporary food preparation. Much of the information I will be giving you – apart from most recipes – comes from ‘Spice Notes’ by Ian Hemphill, the founder of ‘Herbies’ herb and spice store in Rozelle. If you haven’t visited ’Herbies’, then you have missed one of lifes great adventures. If a spice or spice mix exists, you will find it in this store. They also run spice courses, which are very personal and interesting. I am not going to try to cover all the exotic spices in this column, but will provide you with recipes for some of the spices I use regularly. 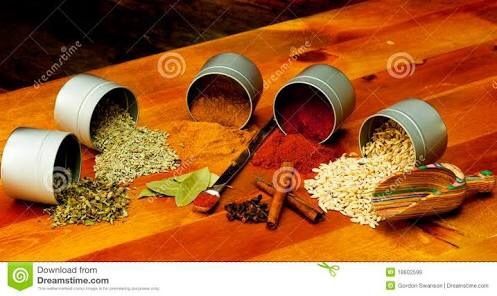 Most spices require heating until fragrant, before using with other ingredients. To do this, heat a frypan, then add the spices for anywhere from 20-30 seconds. As soon as you can smell them, remove from the heat and set aside somewhere to cool. Do NOT leave in pan, as they will continue to cook, then burn. Best grinding results from using a mortar and pestle, though a coffee or spice grinder will do a satisfactory job. Do not store in open containers, as spices will go ‘off’ fairly quickly. Comes from a prickly ash tree found in the Szechwan province of China, near the Tibet border. It comes from the dried red berries that follow the plants flowering, a tiny black seed that is gritty when ground. Its flavour is peppery and tangy, and is slightly numbing on the tongue. The leaves are dried and used bas Sansho, a Japanese pepper. A lot of small pieces of stem and thorns are often included even in good quality mixes, and you need to pick through and get rid of them before using. I find them temptingly fragrant, and though peppery, not overly ‘burning’ in taste. Combine soy sauce and sesame oil in a small bowl. Place Szechwan pepper ands sea salt in a mortar and pestle and grind to a fine powder. Mix through rice flour. Brush pieces of chicken with soy/sesame mix, then roll in pepper and salt mix. Heat 2cm oil in a frypan or large saucepan and fry chicken until cooked. The Saffron crocus is an autumn flowering perennial that belongs to the lily family. Its purple flower has six stamens. Each flower has three stigmas that are attached into the base of the bloom by a fine pale thread called a style. Dried saffron stigmas separated from the flowers are between 10-18mm long, are dark-red, thin and needle-like at one end, broadening slightly until fanning out at the tip in a trumpet shape. It has a honey/woody aroma and a bitter, lingering, appetite-stimulating taste. It is expensive due to it being harvested and produced by hand. Though expensive in large quantities, most recipes only call for a ¼ to a ½ teaspoon of this precious spice, and this can be bought relatively inexpensively. Preheat oven to 180°C. Lightly grease a 22cm round cake tin and line the base with baking paper. Combine the orange juice, zest and saffron in a small saucepan and bring to the boil. Lower the heat and simmer for 1 minute. Leave to cool. Beat the eggs and icing sugar with electric beaters until light and creamy. Fold in the sifted flour, almond meal, orange juice mixture and butter with a metal spoon until just combined and mixture is just smooth. Spoon the mixture into the prepared tin. Bake for 1 hour, or until a skewer comes out clean when inserted in the middle of the cake. Leave in the tin for 15 minutes before turning out on a wire rack to cool. Dust with a little icing sugar, and serve with cream. Star Anise is the dried, star-shaped fruit of a small, Oriental, evergreen tree, and is a member of the Magnolia family. The narcissus-like, greenish-yellow unscented flowers are followed by rayed fruits composed of eight seed-holding segments. The aroma of Star Anise is distinctly aniseed. It has a strong, sweet licorice character, and deep, warm spice notes that are reminiscent of clove and cassia. The flavour is similarly licorice-like, pungent, lingering and numbing, leaving the palate fresh and stimulated. Crush the ginger and star anise in a mortar and pestle and add to a pan with chicken, sherry and stock. Simmer for 20 minutes, or until chicken is cooked and tender. Shred the chicken into thin strips and place in a bowl with the garlic, bay leaves, olive oil, vinegar, onions, salt and peppercorns. Mix well, and leave to marinate in the refrigerator for a couple of days. Serve with a spinach salad and lemon wedges. This Middle eastern spice is from one of 150 varieties of rhus trees. Sumac comes from the berries these trees produce, which are in tightly bunched clusters 8-10cm long, and about 2cm across at the widest point near the base. The berries ripen to a pinkish red, and are finally deep crimson when harvested. Sumac powder is a deep burgundy colour, course textured and moist. The aroma is fruity, like a cross between red grapes and apples with a lingering freshness. The taste is initially salty, tangy and pleasantly fruity with no sharpness. I introduced a number of people to this spice by using it on oven-roasted tomatoes, which it is really delicious with. It also goes well with avocado, chicken and fish. It is one of the ingredients in the Middle Eastern za’atar rub. Place tomatoes cut side up on a baking paper lined baking tray. Sprinkle with salt, castor sugar and pepper, then cover with a good sprinkling of sumac. Drizzle the oil over the tomatoes and roast at 100°C for three (3) hours. These can be served hot or at room temperature as cocktail finger food or used as part of a salad. Vanilla beans come from a member of the orchid family, and there are about 100 species that produce the beans. V.planifolia produces the highest quality vanilla beans, and other varieties pale in significance. The production of the beans is extremely labour intensive, thus there expense. The aroma of vanilla is floral, fragrant, sweet and highly agreeable. Its taste is rich, smooth and appealing, though its flavour can only be truly appreciated in tandem with its smell. You use it by splitting the pod, and scraping out the seeds into whatever you are making. Many dishes also call for the pod to be infused along with the seeds, giving you a much more concentrated flavour and aroma. I have found ‘David Jones’ to be the most expensive place to buy beans, and ‘Norton Street Grocers’ the cheapest. Vanilla essence and vanilla extract are not the same things – the extract is much more concentrated, and expensive. You can also buy vanilla sugar – or make your own by putting a clean, used vanilla pod in a container of caster sugar – and vanilla paste, which again is quite expensive. Heat the cream and vanilla pods in a saucepan. Remove the pods, split, then scrape the seeds (use the blunt side of a kitchen knife) into the cream, then return the pods to the pan. Remove the pan from the heat and infuse for 10 minutes. Remove the pods. Beat the egg yolks and whole egg together, add the sugar and beat until pale and creamy. Stir in the cornflour, then whisk in the infused cream. Spoon the mixture into 6 ramekins or glasses, cover with foil or greaseproof paper, and place in a roasting tin half filled with boiling water. Cook in a pre-heated oven at 150°C for 45-60 minutes until just set and firm to the touch. Serve with spicy biscuits, or a sweet dessert wine and orange segments. I am including this recipe for Tomato Kasundi because it is a very spicy Indian condiment. It takes quite a while to make, but is worth the time and effort. It is absolutely delicious when served up with curries. Heat the oil in a large saucepan, add the mustard seeds, turmeric, cumin and chilli powder. Cook, stirring, for 5 minutes to release the flavours. Add ginger, garlic, green chilli and 30ml malt vinegar and cook for 5 minutes. Add diced tomatoes, brown sugar, salt and extra malt vinegar and simmer for 1-1½ hours.